Tomorrowland is a movie I didn't know I wanted to see until I saw the first teaser trailer with only a few seconds of footage. That was enough to show that this film had a different idea about future tech compared to any other science fiction film I'd seen before it. The thing is, whilst people of my generation and after may not have seen this future before, chances are your parents and grandparents will find it some what familiar. 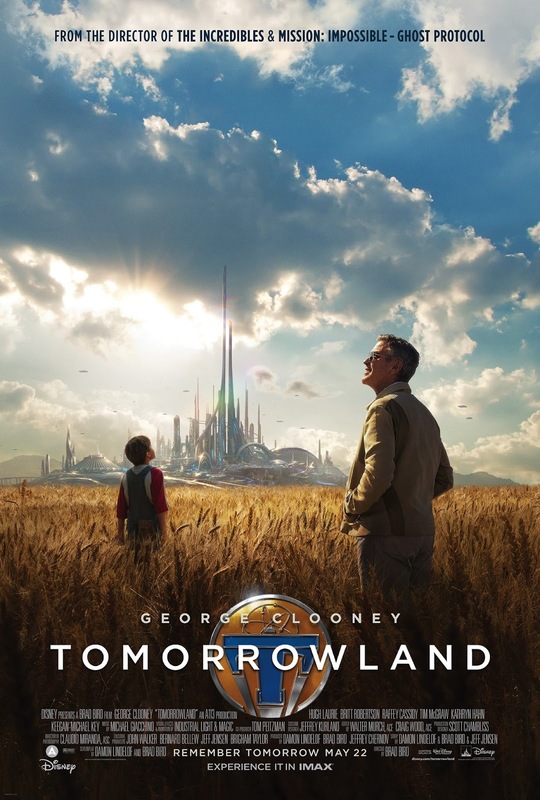 The Tomorrowland of this film is based upon the one Walt Disney envisioned back in the 1950's and 60's and later turned into a theme park. It reflects the optimism held for the future that my generation really only experienced in cartoon re-runs of The Jetsons. When you think about modern science fiction films the majority envision a pretty bleak future of the world in decay, collapsed societies and humans battling machines. In many ways we've come to accept that life will imitate art and the machines will one day take over... if the planet its-self doesn't die first from global warming, man made pollution and the depletion of natural resources. "I think the biggest problem in the world is that we have a generation of young people, and maybe two, who don't think it's going to get any better." That idea is one of the key themes of the movie Tomorrowland in the sense that it makes the observation that our modern day world has lost the optimism that we once had for the world of the future back in Walt Disney's day. It also suggests that we're apathetic towards doing anything real that might change our future back to something more hopeful that we can aspire to. I've heard some reviews say that the story of this film isn't strong but I disagree. For the most part it'll keep you engaged with some interesting ideas along with a glimpse of a future that at one time was more main stream thinking. The hopeful message that it leaves you with is a refreshing change from the 'crisis averted' we can go back to the status quo ending of other sci-fi films. Casey Newton (Britt Robinson) is an optimistic teen with an interest in science and a plan to stop the deconstruction of a NASA launch pad, in order to save her Dad's job as a NASA scientist. When caught sabotaging the cranes at the launch pad she is arrested and invariably spends a night in jail. When her belongings are returned, upon her release, she discovers a pin that wasn't there before. The pin gives her a glimpse of Tomorrowland, a fantastical, futuristic city. From there she embarks on a journey to find the real Tomorrowland. Little does she know that she has been chosen for a much greater task. I really enjoyed the film. Sure it's not perfect. There are definitely moments of ambiguity such as where exactly is Tomorrowland supposed to be located and why are there so many different ways to get there? But if you don't question things too hard and just accept the technology as feasible (none of it really is but - fiction) there's a lot to like with some good humor and action thrown in too. The world would definitely be a better place with more films containing this kind of optimism for the future. Looks impressive from the trailer! If that was happening to me I'd be scared stiff! Well I thought it was a good film. Should have done better at the box office.